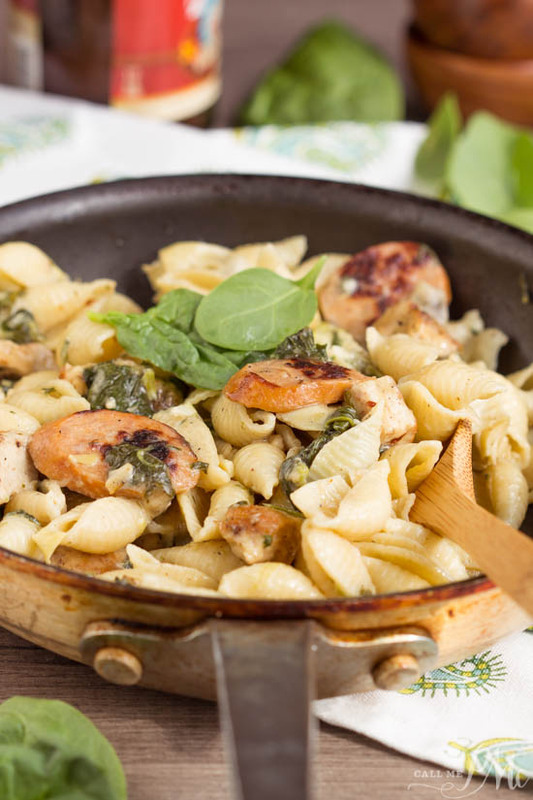 Hearty and flavorful, Creamy Spinach Artichoke Sausage and Chicken Pasta is a 20-minute weeknight meal for your family. 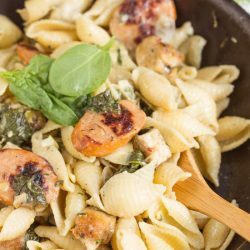 I took the popular spinach and artichoke dip recipe and adapted it as a dinner meal in this Creamy Spinach Artichoke Sausage and Chicken Pasta recipe. It has the same great flavor but with a lighter sauce. It really takes less than 20 minutes to make. It really took me slightly longer than it took the pasta to boil, but I’m like a chopping, cooking mad woman in the kitchen especially when I’m hungry. 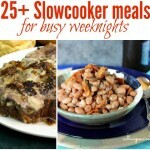 I didn’t want to mislead you so I’m allowing 20 minutes as the cook time. 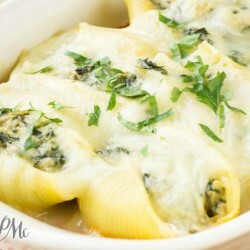 This recipe has a creamy sauce and an earthy flavor from the spinach and artichokes. You know chicken takes on whatever flavors you add to it, for this reason, I like the smokey sausage in the recipe. It adds more flavor and a little heat. You could, of course, use all sausage or all chicken if you choose. 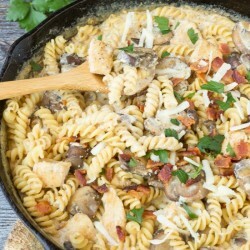 One of the things I like about this pasta recipe is that you can use leftover chicken or rotisserie chicken (or turkey) if you have it. Or, you can cook it fresh if you don’t have leftovers. I use Bryan Smokey Hollow Smoked Sausage. Or, you can use your favorite sausage. 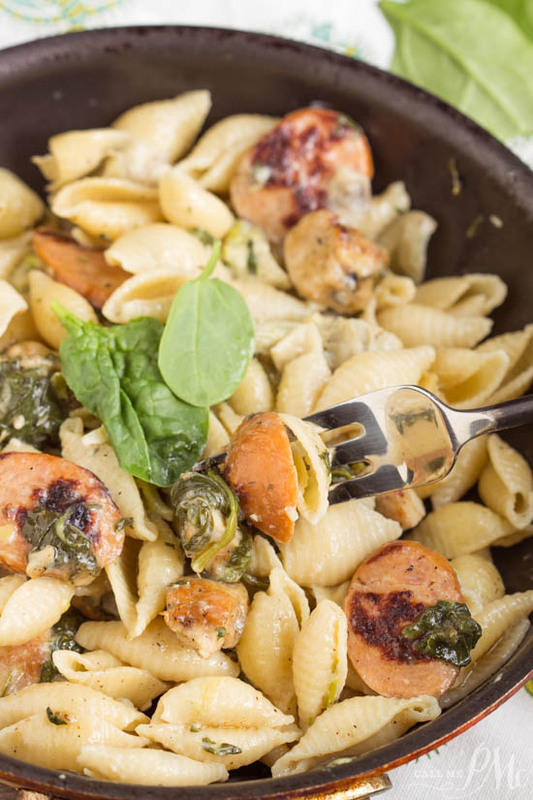 I don’t recommend using a sausage with a bold flavor since there are a lot of flavors going on in this recipe with the spinach and artichokes. I used a small shell pasta. It worked wonderfully to hold all that creamy sauce. A campanelle, elbow, or orecchiette would also catch and hold the sauce. 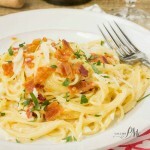 However, you can really use any pasta that you have on hand. 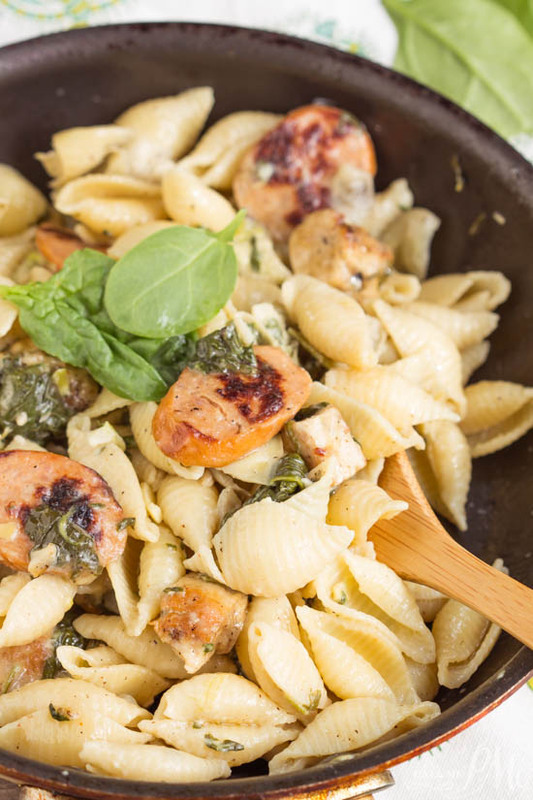 Inspired by the popular dip, Creamy Spinach Artichoke Sausage and Chicken Pasta is a hearty, flavorful, 20-minute weeknight meal for your family. Boil pasta according to instructions to al dente stage. Drain and reserve water. 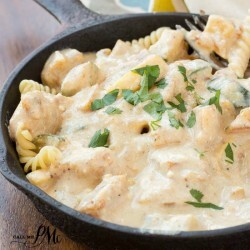 In a large skillet over medium heat, cook the sausage and chicken 6 to 7 minutes or until cooked through. I used a non-stick pan and did not need oil. 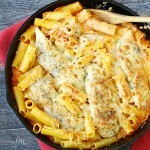 Remove sausage and chicken from pan. You need about 1 tablespoon grease in the pan. Pour off or any extra or if there is not enough use 1 tablespoon of the oil that the artichokes are packed in. On medium heat, add garlic to the pan with the oil/grease and cook about 30 seconds. Add the heavy cream and bring to a boil. Cook until the sauce is slightly thick. 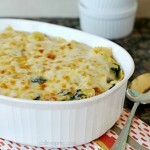 Add the parmesan cheese, chicken, sausage, spinach, artichokes, and pasta to the pan. Toss to coat. Add pasta water is needed to thin sauce. Garnish with more cheese if desired.